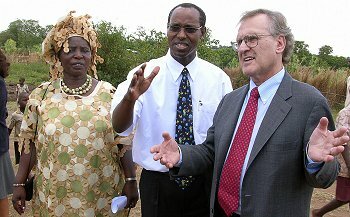 In September, Stephen Lewis, former United Nations special envoy for H.I.V./AIDS in Africa, was invested as Knight Commander of the Most Dignified Order of Moshoeshoe — a knighthood that represents Lesotho's highest honor. Journalist Am Johal caught up with him over the phone from the Nairobi Serena Hotel in Kenya. First of all, congratulations on the honor that you received yesterday in Lesotho. How do you feel about it and what are some of your reflections now that you have been away from the U.N. position for the last 9 months? I don't think there's any new revelations about the five and a half years that I had that role. I tried to chronicle and document it in the reports on the country visits at various meetings and gatherings. There was clear evidence of improvement in terms of anti-retroviral drugs and pediatric drugs for children. There is a continuing focus on prevention, which has been increasingly encouraging over time. But, to be honest, there's a huge amount left to be done. There are aspects of that job that continue to prey on the mind. There is too little improvement towards women and their disproportionate risk to violence and sexual violence from men. Addressing this issue continues to be central to dealing with the pandemic. There are also many orphans and that has by no means been responded to in any adequate way. I think that it's almost unconscionable. Countries are now trying to implement birthing programs, when it should have happened years ago. Things moved painfully slowly at the beginning. The failure of the G-8 to respond to the crisis, which only now British Prime Minister Gordon Brown acknowledges, will hopefully lead to the honoring of their commitments in Gleneagles in 2005. There are hopes that stir in treatment and prevention. Kenya's prevalence rate is down to 5.1 percent. There are empty beds in some of the hospitals. There is an accelerating rate of treatment. There has been a major dent in the pandemic, but there is a world left to conquer. What is the kind of work your foundation is undertaking right now? The Stephen Lewis Foundation in Canada is engaged in grassroots community projects in Africa with grandmothers, orphans and we are funding many, many projects. We are engaging in unusual and inventive work. There has been great solidarity between Canadian grandmothers and African grandmothers. Other organizations have been instrumental. I honor them and salute them. Global fund money is important but small organizations on the ground are doing the most interesting work. The large organizations are doing invaluable work, but they rarely get to the ground. I am still moved by the resilience and strength of communities; the sophistication and intelligence at the grassroots. In the aftermath of the pandemic, we must continue to do the advocacy. A small team is creating an AIDS-free world. We need to now take a strong focus on women and disabled persons, which has been neglected, and an opportunity to get some money to the grassroots advocacy of these activities so the issues can be adequately articulated. What are your thoughts about the International Narcotics Control Board's (I.N.C.B.) positioning related to H.I.V./AIDS and harm reduction? Could you talk about what happened after the Toronto speech where you spoke about Insite, North America's only supervised injection site, last year? The I.N.C.B. is a highly problematic organization which should be challenged on every front. It should be fought at every level and the U.N. agencies should publicly stand up to their agenda, which is ultimately dangerous. Harm reduction is a viable health intervention. The I.N.C.B. 's position, on the other hand, is abominably indefensibly given that they continue to depreciate harm reduction. It is morally problematic what they are doing. They shouldn't act like a branch plant of American drug policy and what worries me is that the Government of Canada could close down the Insite facility (a safe injection facility) if they don't sign the exemption at the end of this year. Drug addicts are desperately in need of help and support, and are open to further infection if they can't access health services. It is the height of irresponsibility, and to make Canadian drug policy a mirror of American drug policy doesn't make sense — it would really be a step backwards, and the I.N.C.B. fuels that paranoia. I don't have many friendly feelings towards them, to say the least. When I spoke in Canada, in support of harm reduction and having alternatives available such as Insite, the Executive Director of the I.N.C.B. called me up the next day and said, "Don't you know that places like Insite are opium dens?" I've been to Insite — it's absolutely the appropriate way to deal with this issue in that particular context. The I.N.C.B. is a terrible organization, and when it comes to AIDS, it should be placed under intense public scrutiny. In which way should the I.N.C.B be reformed so that it realistically acknowledges harm reduction and what would be your message to the Harper government regarding Insite? The Harper government should extend the exemption, which they're perfectly entitled to give. In terms of the I.N.C.B, as an organization, it should be open rather than closed. The positions of the various participants should be known and not kept secret. There may be legitimate issues of drug trafficking, but public reports should be subject to public scrutiny. It should be open to public exposure. We're dealing with life and death here. Drug addicts are not criminals, they are victims. Why should they be subject to the transmission of the virus and be criminalized? It will result, ultimately, in the prevalence of AIDS. Is harm reduction being implemented properly in Africa? Africa is just at the beginning of taking harm reduction measures. There is more injection drug use occurring now. The virus is overwhelmingly transmitted heterosexually. It is being talked of more widely now. The International Aids Conference in August 2008 in Mexico will give more focus on harm reduction, which is crucial. Harm reduction must be a central theme; it must not be an afterthought. The world has to awaken. The spread of H.I.V./AIDS is a huge risk in Asia. There must be an expansion of harm reduction principles and their implementation. For Canada, to now beat a retreat is ridiculous. The I.N.C.B is a pawn in the chess game for American drug policy — this is not acceptable in this age. What is your view of Canadian foreign policy today in places such as Africa and Afghanistan? Canada's unwillingness to set a timetable for investing 0.7 percent of GDP for foreign aid is international delinquency. We, unfortunately, have a militarization of our foreign policy. The development side of the foreign policy agenda has been undermined. You won't achieve anything if you are not doing work in development when there is such a large military intervention. Regarding Afghanistan, in early 2009, the situation will be virtually the same as it is today when the current mission ends. Harper seems to have an interest in Latin America and there has been a shift in emphasis — a terrible mistake in judgment on purely humanitarian grounds. We are making mistakes based on underestimating what we're capable of. The capacity of Canada to trade wouldn't be accomplished by gutting development dollars. You shouldn't do one at the expense of the other. There is on the development side nowhere near sufficient attention, as evidenced by the reduced level of G.D.P. going to development. We must honor the obligations that the other G-8 countries such as Britain, Germany, France and Italy have set. Canada is waging a campaign against making poverty history. We're losing our place in the world. The dilemma we're facing in Africa is largely because of a naïve negotiation. Canada has a disproportionate burden militarily in Afghanistan. We are not sophisticated in the decisions we make. Under Brian Mulroney, a Conservative prime minister, we had a higher rate of foreign aid than any other prime minister when it reached near 0.5 percent of G.D.P. Why can't we set a target to reach 0.7 percent now? You have recently been talking about the need for a women's agency at the U.N. Could you explain why this would be necessary and what it would accomplish? One of the most crucial factors at this moment in time before the U.N. General Assembly is to create an agency for women. I feel strongly the need for this at every front. How can you marginalize 52 percent of the population and think realistically about achieving social justice? An opportunity to create a new agency with an undersecretary-general to do targeted work in countries on the ground is long overdue. Then you could do something about maternal deaths, H.I.V./AIDS, incredible vulnerability and predisposition to violence — an agency that advocates for change like Unicef does for children. There is a tremendous job ahead. There is sexual violence in Eastern Congo; there is a need to compile the litany of early alarms and comments that are being made and to document the horror stories that have etched the landscape of public commentary and how much worse it has to become before we end this war on women. The international system only deals with this on the occasional press release. Instead of a strong women's agency, the issues get lost as only part of the broader violations of human rights. They are without precedent. Soul destroying. We don't have an organization to speak about essential human rights components like these. It's an idea whose time has come. It is only one of the components. You've got to create the agency and give it the support that has been abysmally denied. There are occurrences of female genital mutilation and international sexual trafficking. We need powerful voices who feel strongly about these issues to get the resources they need to articulate these issues and push for reform on the ground. There is no sexual autonomy for women right now. It is very much a major factor in the spread of the virus. You've said of Western ambivalence toward health and human rights in Africa, that racism was at the heart of it. Have things changed over the years … is the situation just as dire now? Are there things to be optimistic about? One of the things that worries me is that there is still some kind of subterranean racism at work when I try to describe Rwanda, when 800,000 people get killed in a genocide, and then, a few years later, comes Darfur. We haven't been able to protect the basic human rights of people in Africa, but how come when it happens in the Balkans, NATO responds immediately? And there are ambiguous responses to H.I.V./AIDS and why, when it comes to this continent, is there no need to engage in an emergency response? This is the equivalent of the Black Death. I don't think people are conscious. This continent is expendable to most political leaders, but it is sophisticated and intelligent at the grassroots. There is incredible resilience here. They are not asking for neo-colonial responses. They are saying, "give us the technical support, we will rout the violence ourselves." The G-8 needs to meet their development goals. Why are countries not allowing for debt relief? It is unjust given the need for health resources. Even Jeffrey Sachs says it's crazy not to provide the dollars when those dollars have been pledged. The current British prime minister is flummoxed. We can't make promises, then turn them in to pledges and then make them broken promises. It is embarrassing how appallingly bad the whole thing has become, this issue of promises being dishonored. The emergence of Gordon Brown in Britain is very significant. This is one of the pivotal moments of hope related to international support for development in Africa. He cares more about poverty and disease than his predecessor and if the Democrats win in the U.S., there could be the possibility of a natural affinity to move on some of these policy matters. It would be a much happier coalition of principle than what it has been a cynical alliance between Blair and Bush. Join to that Sarkozy and Merkel in France and Germany, who despite their conservatism seem to be genuinely interested in African development, and there may be changes forthcoming — a real change in development and human rights. I foresee that Brown and a new American president will do much to fix what is happening on the ground. They must, however, understand the need for a women's agency within the international system. Brown understands that 2015 is only a few years away from the original Millennium Development goals, but we are a million miles away. Gordon Brown has taken a strong stand; it is a complete change in tone and emphasis. This is a complete shift in how the G-8 will be seen if they actually act on their commitments. What are the deficiencies of the international system today? If I look at the system of multilateralism, which includes peace and security, development and human rights, I would say that the secretary-general and Security Council place too great an emphasis on the area of peace and security, to the detriment of development and human rights. They simply don't get enough attention. We need to make certain individual agencies perform as they should and are intended to be doing. We need to ensure that the tremendous contribution they make is actually felt on the ground. Multilateralism is not performing as well as it can on the development side. We need to move more forcefully in improving the lot of humankind. We need to keep hammering away at the Millennium Development goals. I've always been an apologist for the U.N., and have always believed that it could make a huge and profound difference. But its constant plodding and misdirection can make people cynical. However, one of the elements to keep it in check comes from civil society — a role that is desperately needed. Civil society should not write polite letters and engage in diplomatic games, but should take on institutions directly. It should be insistent and uncompromising. Without civil society, we would not have brought the South African government to acknowledge the H.I.V./AIDS crisis. Civil society is absolutely more vital than it has ever been. The world is on the knife's edge. The tremors of climate change are terribly disconcerting, unless there are profound changes brought about by civil society. Thirty thousand kids die every day from preventable causes. Civil society has to root out the problems and bring intelligence to bear on the great international debates. With a strong civil society, governments must shift their public policies. We are ushering in a terrible area, where we will inherit the whirlwind of disease, poverty, war and climate change. There is no excuse in the world on why we should sit back. How can we afford to fight wars in Afghanistan and Iraq and not invest in development? Our priorities are twisted and are out of whack. Would you ever run for politics again in Canada? I am going to continue advocacy on the AIDS portfolio. I was in politics for 15 or 16 years in Ontario — it is sufficient penance in an individual's life. I honor the process, and am a lifelong social democrat, but I am not interested in a return to politics. As tough as the AIDS struggle has been, as slow as the progress feels, it's important that we don't lose sight of the endgame. We need more and more funding, we need to make male circumcision more widely available and respond to these vexing problems creatively. Every day we lose lives. We can't lose our willingness to confront the pandemic. Every government needs to know this. I recently met with the minister of Health in Kenya and in Lesotho — I know how hard they are struggling. They need encouragement and support rather than dismissiveness and passivity from international leaders.